HP Designjet - Dealer of the year 2012! SMGG opens flagship showroom of Mimaki printers at their Bristol branch. Summa Print Finishing Solutions and New Products at Sign & Digital 2013! ONYX achieves full HP Certification on the HP Designjet L26500 and HP Designjet L28500 printers. Introducing HP PVC-free Durable Smooth Wall Paper, the only product in the industry that is Type II (ASTM F793) compliant with HP Latex inks that doesn’t need a top coat! Your customers can now channel their inner van Gogh and create unique, custom wall art. Imagine the business opportunities with this one-of-a-kind wallcovering. Suitable for use in both residential and commercial environments that are subject to wear and tear. HP PVC-free Durable Smooth Wall Paper is easy to use with common primers, pastes, and installation methods, and it’s scrub- and scratch-resistant. 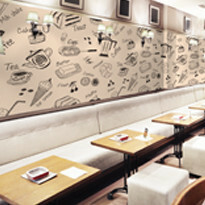 An added benefit is that wallcoverings produced with HP PVC-free Durable Smooth Wall Paper are odorless, mold- and mildew-resistant, and environmentally safe with multiple environmental qualifications your customers will appreciate including FSC®, REACH, and UL GREENGUARD GOLD certifications*. Check out this video that explains more about this wallcovering that needs no lamination.